Can this impressive £199 laptop trump pricier rivals? A bargain basement option that's got enough power to cope despite obvious budget cuts elsewhere. Lenovo has designed this laptop for low intensity tasks, so we expected it to arrive with a budget price – but we didn't expect it to cost just £199 (about $334, AU$360). That makes it one of the most affordable notebooks we've reviewed. That eye-catching price undercuts every rival. We thought the Toshiba Satellite C50 was cheap, but it costs £240 (about $403, AU$435), and HP's Pavilion TouchSmart 15-n070sa costs a comparatively stratospheric £350 (about $589, AU$634). The Lenovo doesn't look like such an affordable portable. The matte plastic exterior is subtle, and the metal-effect logo along with the green dotted power button look smart. It's plain, but it's not nasty. The B50 trades blows with rivals in terms of its dimensions, too: the 2.15kg weight (about 4.7 pounds) is less than both competitors, and the B50's 25mm-thick (about 0.98 inches) body sits between the thinner HP and chunkier Toshiba. It's thin and light enough to carry day-to-day, although we'd always use a protective sleeve – the plastic looks smart, but it's flimsier than the HP and Toshiba laptops. Despite the low price, Lenovo has included a good keyboard. It's a Scrabble-tile unit with a numberpad and a sensible layout, and it's comfortable to use – the keys have good travel, and their action is responsive and soft. It's as good as anything else we've typed on at this price, including the Toshiba. The trackpad is reasonable. It's a little larger than the Toshiba's effort, and the buttons require light touches and little pressure to use. More expensive laptops have better ergonomics than the Lenovo – we'd prefer a snappier typing action and firmer buttons – but there's enough quality here to get work and web browsing done without difficulty. 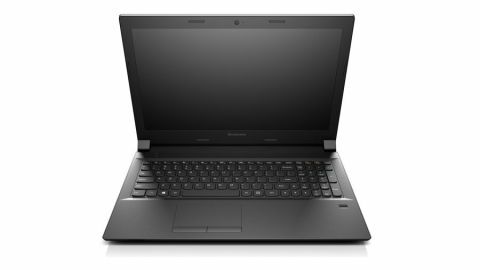 The sub-£200 Lenovo is powered by an Intel Celeron N2830, which uses the same Bay Trail architecture that's included in modern Atom chips. Its two cores are clocked between 2.16GHz and 2.41GHz, and the chip has a basic Intel HD Graphics core that runs at a top speed of 750MHz. This is where the Lenovo's budget bites. Its two rivals use mid-range AMD Kabini APUs. They're both clocked to slower speeds than the Lenovo's Intel silicon, but have four cores and more cache. It's the same story in graphics, where the AMD chips have lesser clock speeds but a more impressive Radeon architecture. There's just 4GB of RAM and a 320GB hard disk, and networking is restricted to a single-band 802.11n Wi-Fi chip alongside Bluetooth 4.0 and Gigabit Ethernet. There's one USB 3.0 port around the Lenovo's edges, but the interior is more impressive – there's a spare memory socket, and the main components are all accessible.